design – No Power Required! The innkeeper 1x gets audio in and out of analog telephone lines. Its excellent caller audio output does not exhibit the transmit/receive crosstalk common to analog hybrids. This makes innkeeper 1x perfect for radio or television talk shows, teleconferencing, or auto-answer IFB feeds. 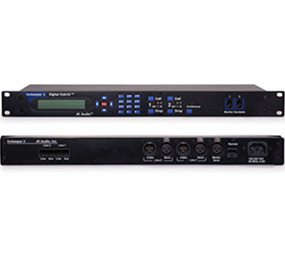 Innkeeper 2 squeezes two independent digital hybrids in a 1U rack space. The front panel keypad, display, and handset jacks provide easy speed dialing and call setup. Digital hybrids allow you to send signals into the phone line while maintaining excellent separation between your voice and the caller. 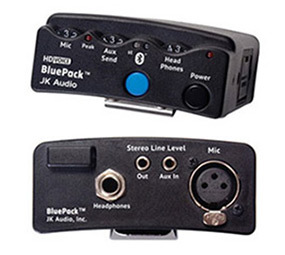 The balanced XLR output jacks contain only the caller’s voice. 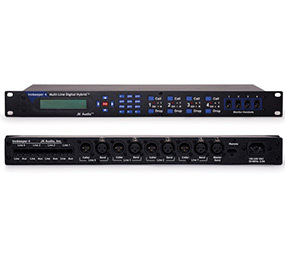 Innkeeper 4 squeezes four independent digital hybrids in a 1U rack space. The front panel keypad, display, and handset jacks provide easy speed dialing and call setup. Digital hybrids allow you to send signals into the phone line while maintaining excellent separation between your voice and the caller. 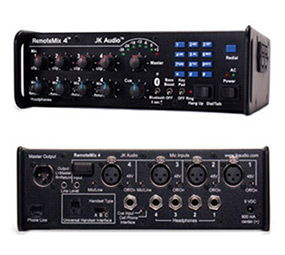 The balanced XLR output jacks contain only the caller’s voice. 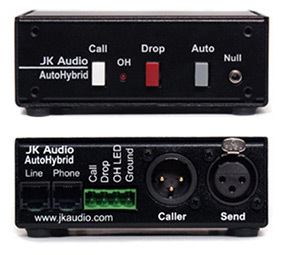 JK Audio introduces a modular family of talk show system components. The heart of the system is the new Concierge™ switch core, allowing connection of two hybrids across six phone lines. 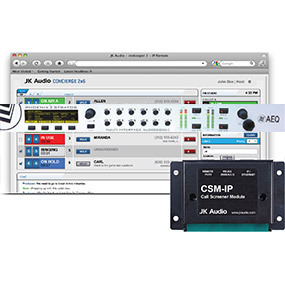 CSM-IP is a remote interface to the JK Audio Concierge Talk Show System. 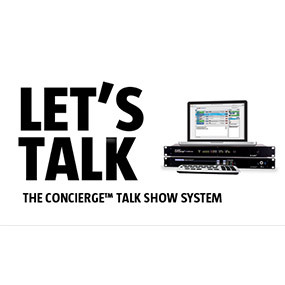 CSM-IP contains a web server that allows the user remote control of their Concierge Talk Show system through their web browser. More than just a virtual Guest Module, CSM-IP adds Call Screening capabilities, call timers, and features beyond the physical control surface. Clear indication of Call state and Priority in queue. 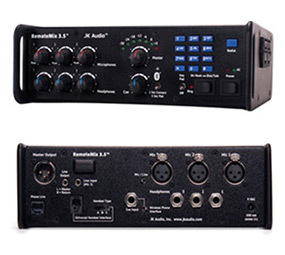 RemoteMix 2 is a two-channel field mixer / headphone amplifier built for the remote broadcast environment. 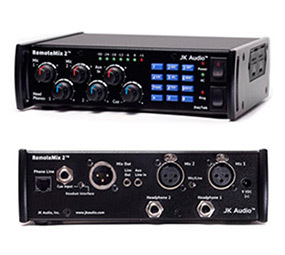 More than just a field mixer, RemoteMix 2 provides a communications interface for remote broadcast, IFB, or a backup audio path. The integrated headphone amplifier provides sidetone to monitor all inputs plus an external feed. RemoteMix 2 features a phone line hybrid with keypad along with a wired notebook/cell phone headset interface. All sections are designed to work together, saving setup time and wiring in the field. Two 1/4” headphone jacks with individual level controls. 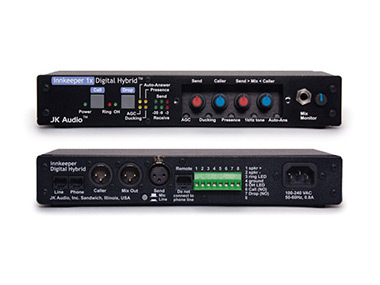 JK Audio introduces RemoteMix 3.5™, a three-channel field mixer and headphone amplifier. More than just a field mixer, this is a universal communications interface. RemoteMix 3.5™ features a phone line hybrid and keypad, a PBX handset interface, and both wired and wireless cell phone interfaces. These parts were designed to work together, saving setup time in the field.